Product TitleAleene's Acrylic Gloss Spray Sealer, 6 Oz. Product TitleKrylon Artist Spray Workable Fixatif, 11 Oz. 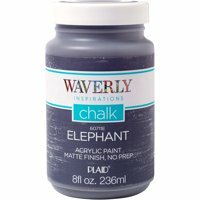 Product TitleAmerican Crafts Black Chalkboard Paint, 16.5 Oz. Product TitleFolkArt Glow Green Paint, 1 Each, 8 Fl. Oz.